Certainly, anything to do with eCommerce is more likely to be relevant to retail sites. However, there are always lessons to be learned by B2B organizations. This article by Shane Barker looks at how to boost your mobile conversion rates for eCommerce. It is another article in our “Great Articles You may have missed” series. Did you know that global eCommerce sales are set to reach $2,774 trillion by 2018? However, most eCommerce businesses are still plagued with low mobile conversion rates. As of Q1, 2017, global conversion rates for desktops hovered at 3.63%, and that of smartphones was lower, at 1.25%. Desktop users enjoy faster page loading speeds. Desktop users find it easier to access the main menu. The search bars are more prominent on desktop. Product categories, images, and descriptions are clearer on desktop versions. The ubiquitous smartphones are ruling the roost, resulting in a heavy rush in online traffic. Today, more than 52% of global web traffic is generated from smartphones. So, creating a friendly shopping experience for mobile users is a must. If you don’t, you’re likely to miss a huge chunk of business from these users. Here are 6 super effective ways in which you can optimize your mobile conversion rates. Painfully slow loading speeds of websites can frustrate any user. A study found that 53% of users leave if a mobile site takes more than 3 seconds to load. 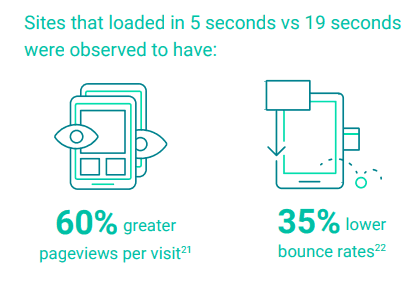 However, the same study also found the 3 out of 4 mobile sites have load times of over 10 seconds. Mobile sites that load in 5 seconds or less generate 2X the revenue from mobile ads than those which take longer. 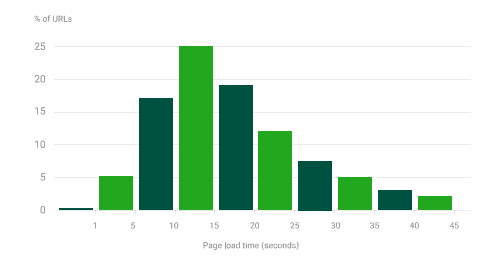 Now you know why speed is important when it comes to loading times of your mobile site. And unless you drastically improve the loading speed of your mobile web pages, you won’t get decent mobile conversion rates. Focus on reducing the number of server requests. This means assessing the types of requests to find out the benefit it offers. For example, are you using too many analytics trackers? Or are your ad setups the culprit? Run diagnostics to check which files are using up most of the bytes of your pages. Large files take more time to be downloaded. So cutting down file sizes makes good sense. You can do this by reducing image sizes to fit mobile screens and keeping the number of fonts minimal. Bulky ad techs and videos can weigh your site down. Prioritize the elements that need to be displayed above the fold instead of having everything load at the same time. Multiple ad tech requests or large file requests can slow down the loading speed of your site. Mobile-Friendly Test – This is a useful tool that will tell you whether your site is mobile-friendly or not. Google Analytics – This will allow you to see how fast users are able to engage with your content and where the bottlenecks are. WebPageTest – This tool will run various speed tests on your website and conduct various optimization checks. And finally, it will provide you recommendations for any improvements that you can make. Typing in tons of information is not only irksome but also more difficult to carry out on a mobile screen. Even if they like your products, they might just abandon their carts if they have to enter their payment information. Because it’s cumbersome to do so on a mobile device. And as you can imagine, this can drastically lower your mobile conversion rates. So, how do you get around this problem? By allowing the use of digital wallets for payment on your website. Essentially, it’s a service that lets consumers save their payment details online but in a way that’s extremely secure. Due to multiple layers of encryption integrated into mobile wallets, consumers can make payments safely and conveniently. To optimize your mobile conversion rates, integrate digital wallets like Amazon Pay, PayPal, or Apple Pay into your store. A study by Baymard Institute found that 19% of shoppers abandon carts because of security concerns over sharing payment details. Mobile wallets can combat this issue head-on. Here’s an example from mobile phone mounting solution provider, Nato Smart Mount. When you add any product to your cart using their mobile site, you’ll see an option of making a payment using Amazon Pay. This is in addition to the usual payment option using your credit card. The presence of a digital wallet makes it convenient for shoppers and is a great way of increasing mobile conversion rates. Trust is one of the primary drivers of purchases online. And the look of your website can greatly impact your credibility in the minds of your potential customers. If your mobile site is unresponsive and badly-designed, it comes across as really amateurish. Your potential customers perceive you as someone who has no idea what they’re doing. This impacts credibility and trust. And consequently lowers your mobile conversion rates. 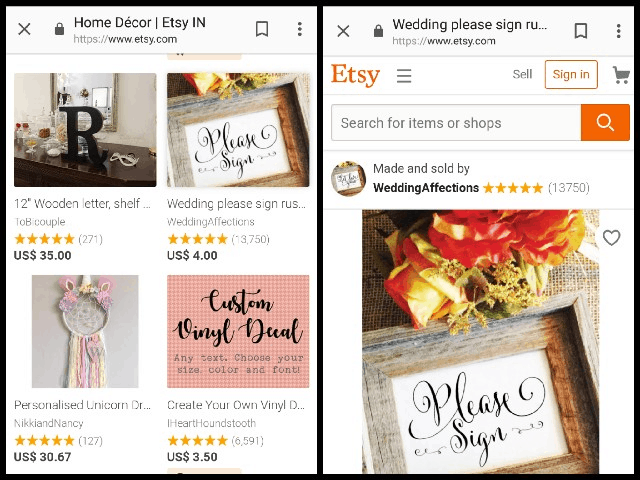 65% of the traffic to eCommerce stores on Etsy comes from mobile shoppers. And one of the most important reasons why these people love shopping from Etsy is due to the responsive design. Look how clean and responsive their mobile site is. If your mobile site is not easily navigable, it can negatively impact your mobile conversion rates. Simply because customers will be completely clueless about where to click and where to go. This will greatly impact their experience and will encourage them to leave. However, if you can deliver a great user experience, it will certainly lead to much better mobile conversion rates. So ensure that mobile users are able to navigate through your site with minimum effort and find what they are looking for. Arrange all the page elements in a neat order. This will help users browse through effortlessly and systematically. Make sure that your images are displayed followed by pricing information. Make your CTA button prominent, and product descriptions should be accessible by simply scrolling down the page. An uncluttered page ensures greater readability. 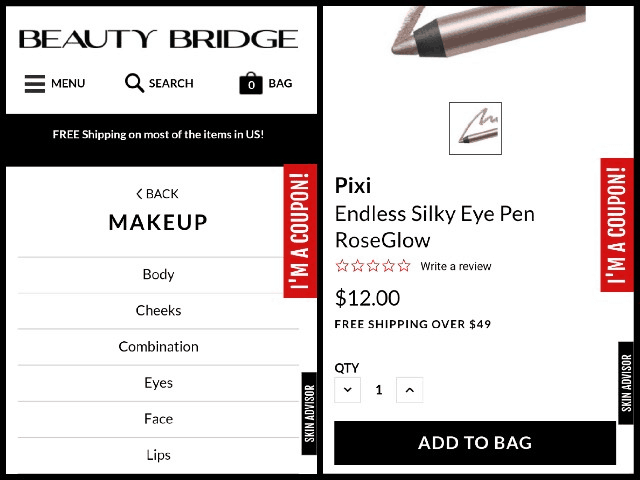 Here’s an example from Beauty Bridge, a cosmetic brand. You can see how easy their navigation menu looks on the mobile site. Also, their product pages are uncluttered giving a great user experience. There’s no denying that pop-ups when implemented correctly are extremely effective at generating leads. 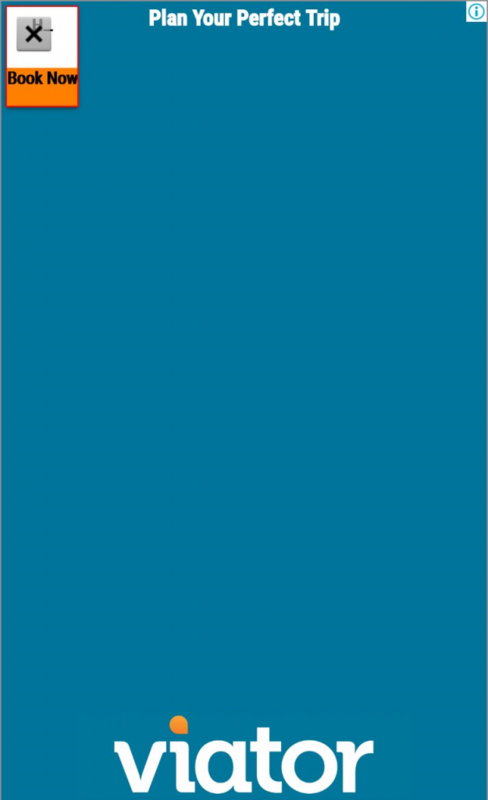 However, when it comes to the mobile experience, there is probably nothing more annoying than these. Not only are they intrusive but also prevent users from being able to view what they really want. The result? Greater bounce rates and lower mobile conversion rates. The Coalition for Better Ads conducted a study about online ads in which they surveyed over 25,000 people. According to this study, the following are some of the most detested ad types on mobile sites. So, if your mobile site uses any such pop-ups, videos, or animations, remove them now. This can have a great impact on your mobile conversion rates. In fact, Baymard Institute found that 28% of people abandon carts if the checkout is long and complicated. Another 37% of people ditch their carts if the site mandates creating an account. These issues are even more marked in the mobile experience. This is certainly avoidable if a few important points are kept in mind. Don’t clutter the page with too many fields. 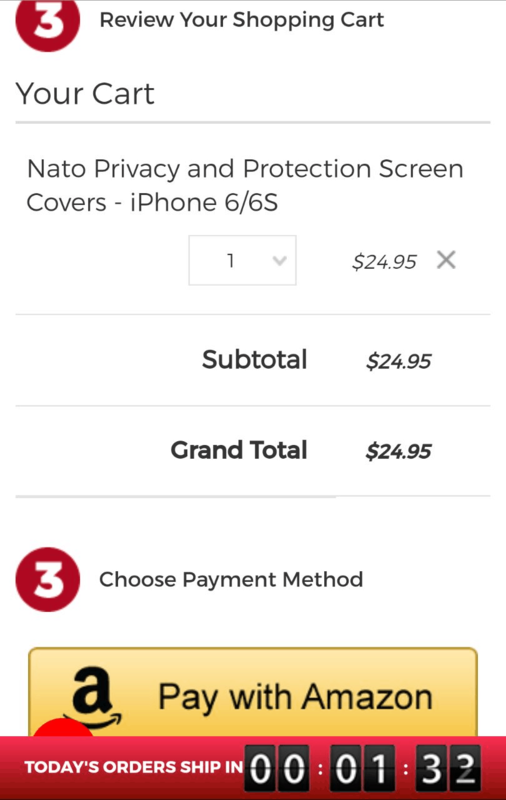 Here’s a great example of a mobile checkout page. 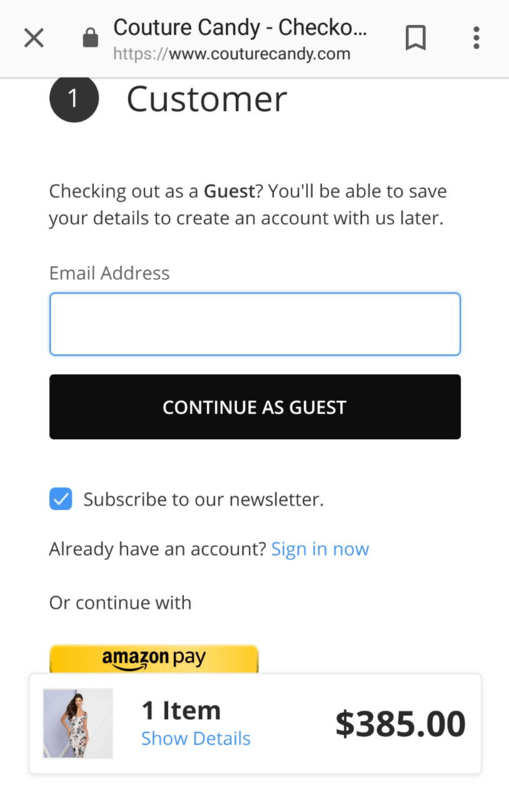 Not only does it allow the option of checking out as guest but also the option of using Amazon Pay. It also prominently displays the cart value so that customers know exactly how much they’re paying for. A great user experience goes a long way in increasing mobile conversion rates – which is what eCommerce today is all about. So make sure that you use the above-mentioned strategies to optimize your mobile website. Can you think of any other effective ways to optimize mobile conversion rates? Let me know in the comments below. This article previously appeared on shanebarker.com, under the title “6 Super Effective Ways to Optimize your Mobile Conversion Rates“. It is republished here with permission.